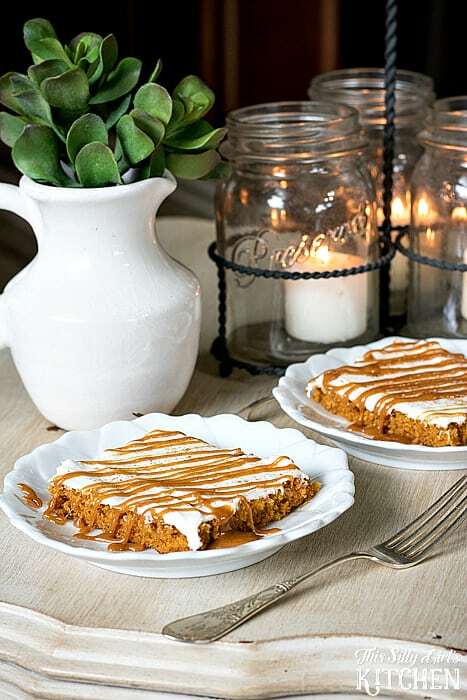 Caramel Pumpkin Sheet Cake, light yet moist pumpkin sheet cake topped off with the best cream cheese frosting and drizzled with pumpkin spice caramel sauce, your fall dessert dream come true! 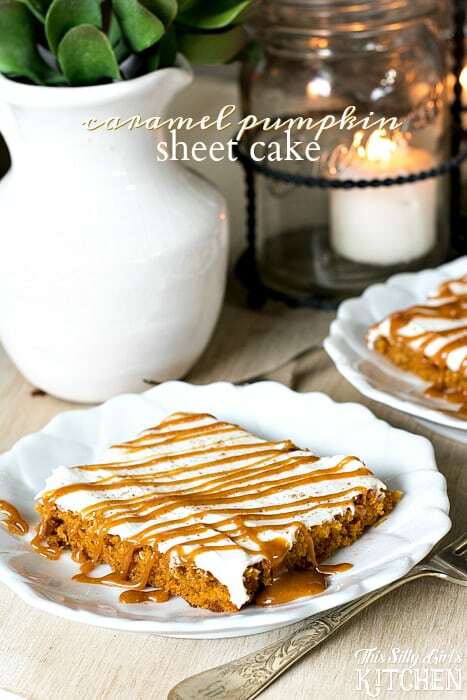 Caramel Pumpkin Sheet Cake…. swoon. Fall is in the air, my friends! Or, that just might be my cinnamon pumpkin candle talking but to me it is FALL! So, naturally that means I have been baking up all kinds of fall goodies lately… can you blame me? 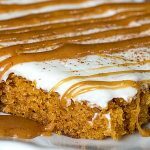 I just got done creating this dreamy fall staple dessert, pumpkin sheet cake. 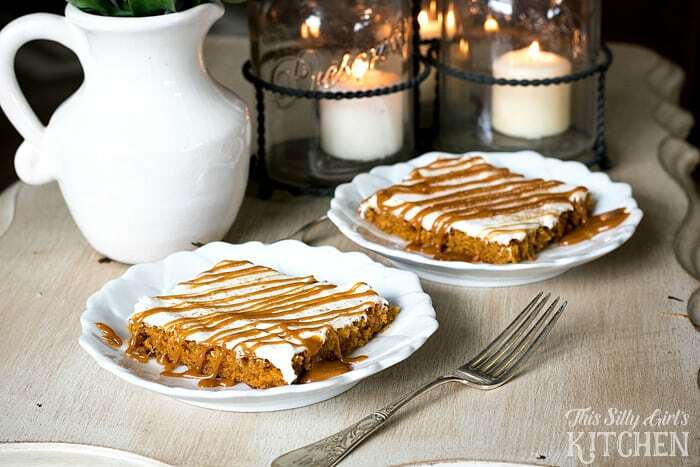 BUT, you know me, I had to kick it up with a Heavenly cream cheese frosting and pumpkin spice caramel sauce… swoon. I know you are feeling the fall vibes now too, aren’t you?! The inspiration for this sheet cake came from International Delight coffee creamer. I know that might sound a bit odd but coffee creamer is not just for coffee my friends. Although, I do love to start my day off with a piping hot mug of the good stuff and you know what that means, pumpkin spice baby! My local Walmart already has their fall seasonal International Delight coffee creamers out so you KNOW I snatched them up. They had them in a special little bunker in the middle of the aisle by the milk and other creamers. 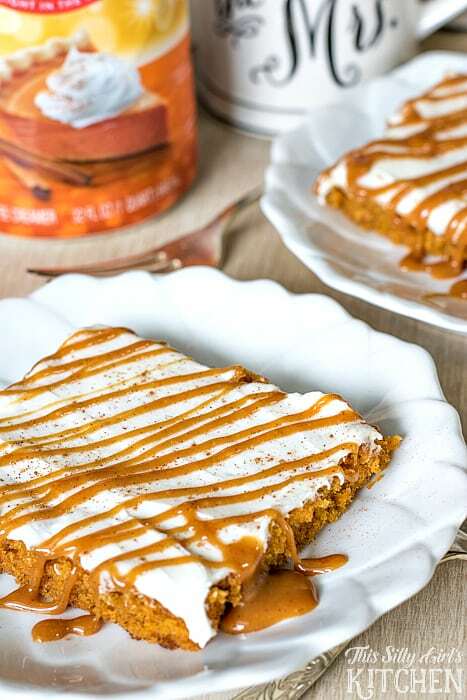 I used the International Delight® Pumpkin Pie Spice Coffee Creamer flavor in my caramel in place of using just plain heavy cream and WOW. I’m never going back! Preheat oven to 350 degrees. Place pumpkin, granulated sugar, oil and eggs into a large bowl. Whisk until combined. In a separate bowl mix together the flour, baking soda, pumpkin pie spice and salt. Slowly add in the dry ingredients into the wet until just combined. Pour mixture into greased 17x11 inch baking sheet for 18-20 minutes until toothpick inserted into the center comes out clean. Place on a wired rack and let cool completely. Cream the cream cheese and butter together. Add the vanilla, add the powdered sugar in ½ Cup at a time until fully incorporated. 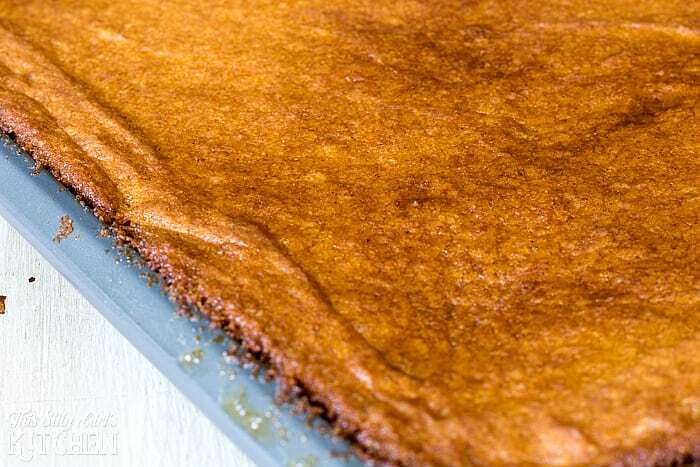 Once cake is cooled, frost the top of the sheet cake. Place all of the ingredients except for the vanilla into a medium sized sauce pot. Bring to a boil over medium high heat, reduce to low. Simmer on low for 6 minutes. Take off the heat, add in the vanilla, let cool slightly. Drizzle over cake while it is still warm, enjoy! Recipe for the sheet cake adapted from here. 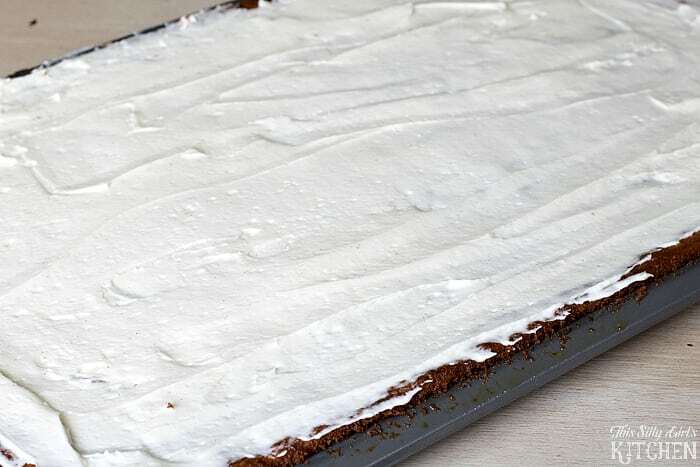 Come back here and tell me how amazing your house smells after baking this sheet cake! This makes a thin layer of cream cheese frosting. If you REALLY love frosting, double the recipe! Isn’t it just so inviting? I sprinkled a touch of pumpkin pie spice on top just for a little extra touch. I like it looks so pretty! I can’t wait to try this I need to measure my pans though to see if I have that size pan ?! 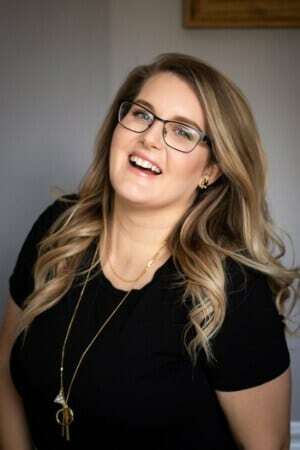 Thanks so much, Laura, this one is definitely a keeper! !